Fans of “Alice in Wonderland”, and those who love fantasy stories, will love the Forest of Wonders slots machine from PlayTech. Incredible and beautifully designed images fill every inch of the screen in this themed bonus video slot. Players familiar to the Alice stories will recognize many of the major symbols, including the March Hare, Caterpillar, Cheshire Cat, Mad Hatter and various playing cards in the Ace, King, Queen, Jack and Ten formats, as well as bonus symbols like the dormouse and the white rabbit. 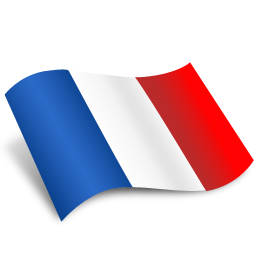 These symbols appear in a possible thirty five winning combinations across the paylines. The five reels and twenty five paylines of the game deliver a maximum jackpot of five thousand coins to players who can bet using a range of coin values – from one cent to five dollars. Players are allowed to wager up to two hundred and fifty coins per spin on the slot Forrest of Wonders. 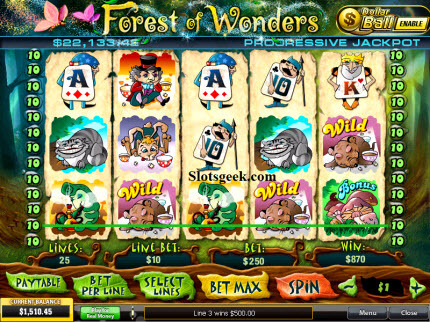 The all ready excellent features to the Forest of Wonders slot machine is enhanced by the scatter and wild symbols, bonus games, and autoplay option. Within the Forest of Wonders slot machine the sleepy little dormouse serves as the wild card and the jackpot symbol. He can substitute himself wherever a player needs him in order to create a winning combination. He cannot replace either the scatter or bonus symbols respectively. The elusive white rabbit serves as the scatter symbol in the Forest of Wonders slots game. Three or more appearances of this symbol on non-winning reels will reward the player with free spins – when the symbols are revealed the player is told to select one of the white rabbit symbols and that symbol will reveal how many free spins go to the player. There are two bonus games in the Forest of Wonders online slot machine. The first is the “Dollar Ball Enable” button that triggers the bonus feature at the beginning of play. The gamer is asked to select five lotto numbers from a potential forty nine choices; if their numbers match the progressive jackpot numbers then they get the entire jackpot. The other bonus round is activated by the lucky mushrooms symbol. Should three to five consecutive mushrooms be revealed along an active payline the bonus screen is opened. The bonus game is a “pick a box” feature that allows a player to advance to other levels of prize picking, and continues to reward the player if they continue to choose correctly. The payouts for the “Forest of Wonders” slots game are very generous. The wild card delivers a maximum jackpot of five coins, at a maximum bet of twelve hundred and fifty dollars! Four dormice on the payline gives five hundred coins, three bring one hundred coins and two deliver ten coins. The March Hare, Caterpillar, Cheshire Cat and Mad Hatter all pay on a reveal of five to two times along the reels. The Hare gives from two hundred to three coins, the caterpillar brings a reward of one hundred and fifty to three coins, the Cat has a reward range of one hundred and fifty to two coins and the Hatter gives a one hundred to two coin payout. The Cards only pay on a five to three symbol reveal and have rewards that vary from seventy five to five coins respectively. The Forest of Wonders slots game from PlayTech offers fantastic fun and intensely rich graphics. The fairy tale storyline will attract many players since it is not a common element in many slots games.